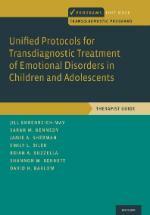 The Unified Protocols for Transdiagnostic Treatment of Emotional Disorders in Children and Adolescents (UP-C/UP-A), developed by Dr. Jill Ehrenreich-May and colleagues present the compelling idea that there may be a more efficient method of presenting effective strategies, such as those commonly used in cognitive behavior therapy and third-wave behavior therapies, in order to simultaneously address an array of emotional disorder concerns in children and adolescents. 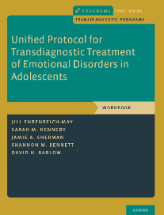 The child and adolescent Unified Protocols frame treatment strategies in the general language of strong or intense emotions and promote change through a common lens that can be flexibly adapted across youth emotional disorders, including anxiety, depression, obsessive compulsive disorders and others, sub-threshold presentations of such or combinations of these problem areas. Specifically, the UP-C and UP-A help youth by allowing them to focus on a straightforward goal across emotional disorders: reducing intense negative emotion states by extinguishing the distress and anxiety these emotions produce through emotion-focused education, awareness techniques, cognitive strategies, problem-solving and an array of behavioral strategies, including a full-range of exposure and activation techniques. Where can you buy the UP-C and UP-A materials? 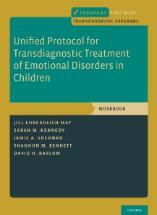 The UP-C and UP-A therapist guide (which includes both an individual, modular therapy for adolescents and a group therapy for children with a full parent-directed curriculum, as well) and two accompanying workbooks for children and parents and adolescents, respectively, are available through Oxford University Press and select online retailers, such as Amazon.com. How can you get training in the UP-C and UP-A for yourself or your agency? Dr. Ehrenreich-May and colleagues that are certified as UP-C and UP-A trainers provide in-person trainings to organizations and individuals, as well as online training resources and ongoing consultation to support fidelity and competency following training. Please complete the form below to request a training, consultation, or other service.